Amongst the flux of multiple YA adaptations like The Hunger Games and Divergent, last year’s The Maze Runner was something of a small surprise, being better than anyone probably thought it would be with its intense action and reasonably likable characters. The lack of a satisfying ending, however, made it clear that more of the story was to be told and that it could not work as a standalone film, no matter how decent it was. 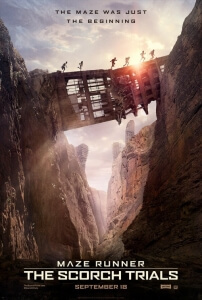 Now, almost a year on from the first film’s debut, comes the second film in the Maze Runner saga subtitled The Scorch Trials which, like the previous flick, is based on the book by James Dashner. Is it a worthy continuation, or does it suffer from the same problems as before? The answer, funnily enough, is both. The story picks up shortly after the ending to film #1, where Thomas (Discount Logan Lerman Dylan O’Brien) and his friends have been picked up by military forces after surviving the perils of the maze. Naturally, those forces aren’t who they say they are, and the young heroes soon escape and find themselves wandering a desert wasteland that used to be San Francisco (we know this because the ruined Golden Gate Bridge is shown in several shots). Along the way, they encounter new allies and enemies while learning more about the world that now exists in lieu of the previous one. In limited ways, The Scorch Trials is a perfectly competent follow-up to what came before. It seeks to continue the story rather than just rehash things (how annoying would it have been if it had gone the Hangover Part II route and just place them in yet another maze, with only the slightest of differences? ), we explore more of the world that was only teased before, and we still find these characters decent enough to follow and make sure they survive along with a host of brand-new characters such as Giancarlo Esposito’s quirky resistance leader Jorge. The overall story offers much more compelling and intriguing set-ups than anything in the ongoing Divergent film series, simply because our levels of caring are significantly higher. However, what makes this nothing more than a sequel that’s on-par with the original is its alarming inconsistency, with one too many tones and motivations being juggled about that make things more confusing than overall satisfying. Though the first act is standard government paranoia operating at a level most teenage audiences can care about, once the main characters make it out into the “Scorch” things get a bit muddled. As it turns out, much of the human race has succumbed to a “Flare” virus which has turned them into the creatures from I Am Legend, with the speed of the Infected from 28 Days Later – so, for parts of the flick, it surprisingly becomes a zombie movie, with characters encountering them in dark rooms for several jump-scares, scenes of them running away while fighting them off, and making ethical choices when one of their own is bitten and starts becoming one of them, like something right out of a Walking Dead episode. Then, right out of nowhere, it turns into something completely different like a strange drug drama (in a scene where Thomas makes his way through an eerie club run strangely enough by Alan Tudyk) and, by the film’s action-heavy climax, a war movie. This movie can’t seem to pick a tone or genre and just run with it, which can be annoying for the single-minded film-goer. Once again, the film ends with yet another cliffhanger ending, leaving things in an even more incomplete and unsatisfying state than before. Not only does this mean we now have to wait for the inevitable third film based on Dashner’s own trilogy-closer The Death Cure (which is not scheduled until early 2017, so it’s even longer we have to wait now), but also that this is yet another film in the Maze Runner series that cannot stand as its own standalone film. It’s a shame, because there are genuine qualities to these films but since they’re bound by the structure of the books they’re based on, they have to keep to them otherwise endure the wrath of several angry fans (then again, from what we understand, this movie is far different from the book it’s based on). We just hope that The Death Cure is one of the rare YA finales that ISN’T split into two films, since although The Scorch Trials does have its genuine qualities this series deserves a proper ending as quickly as possible. Maze Runner: The Scorch Trials is a sequel that’s roughly on-par with its predecessor, but its inconsistent tone and yet another unsatisfying conclusion do not give it enough strength to be anything more.